As a quick introduction to me, I am an Artist with the solid engineering background. When I’m asked if I can make something I almost always say yes. Because as an Artist and Engineer, I know that anything is possible. The work I do is made by myself. I make things, it’s as if I can’t stop myself. Using stainless steel to make up my structures & taking some inspiration from a passage of text. A song, poem, a word of kindness or bitter words in haste; all which can harness intense emotion and leave the scars of pain or the warmth of Love. My work? I want it to complete connections. I want it to be the connecting piece between people, people and their past, their present and future aspirations. I want to highlight the good from the past, of the present and for the future. When I’m asked if I can make something I almost always say yes. Because as an Artist and Engineer, I know that anything is possible. The work I do is made by myself. I make things, it’s as if I can’t stop myself. Using stainless steel to make up my structures & taking some inspiration from a passage of text. A song, poem, a word of kindness or bitter words in haste; all which can harness intense emotion and leave the scars of pain or the warmth of Love. 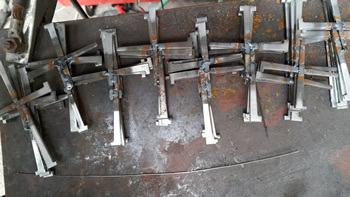 This Crucifix I am making from many hundreds of Crosses welded together. Each one made by welding 2 cut & clasp nails end beside end, cutting a 3rd nail in half & welding it to the others forming a small Cross. The next stage is to weld these Crosses together generating a mesh, then folding this mesh to create the large 3 dimensional Crucifix. The Crucifix I wish to send on a tour of Churches and I want to fund this project by selling the individual Crosses, Crowd Funding. Each Church I will ask to buy a minimum of 25 small Crosses at £25 each, 10% will go back to the Churches and these establishments will have the loan of the large Crucifix for 1 month. Each person donating £25 will receive a small Crucifix made from the cut & clasp nails.